W hen I want to meet friends for a special evening and we're picking restaurants, San Miguel has a lot of options. But La Brasserie is the place that most often comes to mind for me. I've loved the Café de la Parroquia since it first opened in 1989 and often lamented the fact that it was not open for dinner. With La Brasserie, it is. 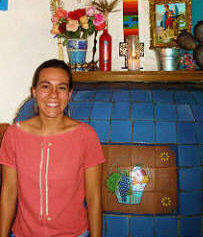 La Brasserie's owner/chef, Valeria, is the daughter of Francoise, the French-born owner of La Parroquia. She grew up waiting tables there and helping out in the kitchen, so she's learned the business top to bottom. A couple years ago, it was clearly time for her to spread her wings, and La Brasserie was born. Once the wrought-iron gates of La Parroquia close on the late lunch crowd, La Brasserie starts gearing up to delight diners in the same space. It becomes a French bistro with a Mexican accent—one of the most pleasant restaurants San Miguel style. Sit by the flower-filled fountain in the courtyard or inside the small front room with a view of the street. Candlelight and soft French-Latin jazz create a lovely ambience for what is really fine food, simple in preparation, elegant in presentation. The menu is limited, with several prix-fixe meals offered each night. One of the choices is usually fish, and it is consistently excellent—some of the best in San Miguel de Allende. Prices are extremely reasonable for food and atmosphere of this quality. A full dinner of entree, salad, dessert and wine will run less than $15 per person. The flinty white house wine is especially good. Insiders Tip:Save room for dessert. I adore the prune and mango tart, and a friend is in love with what he calls "a chocolate mousse to break your heart." When you're wondering where to eat in San Miguel de Allende, try La Brasserie, a classy, casual, delicious choice among restaurants in San Miguel.